Le nouveau yokozuna Kisenosato est l’unique leader du championnat après sa victoire sur Yoshikaze. 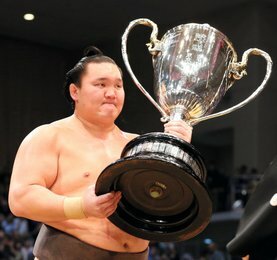 Le yokozuna Kakuryu s’est imposé face Takayasu, infligeant ainsi au sekiwake sa première défaite tandis que le yokozuna Kisenosato est resté invaincu. 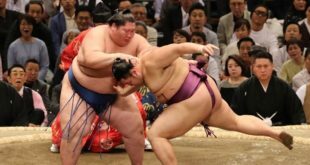 Le nouveau yokozuna a survécu aux diverses tentatives de Yoshikaze et a amélioré à 11-0 son score. 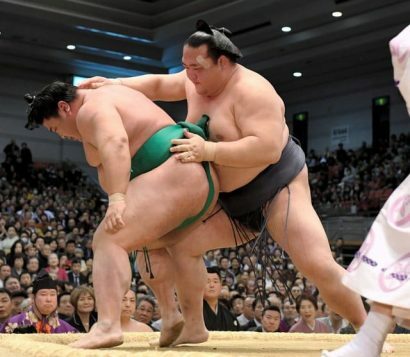 L’ôzeki Terunofuji et le maegashira 10 Tochiozan ont également rejoint Takayasu à la seconde place du classement. Takayasu est entré dans son match avec un score de 5-11 face à Kakuryu (8-3), et même s’il semblait solide et pleinement capable de battre le mongol, il n’a pas été en mesure de remporter le match. 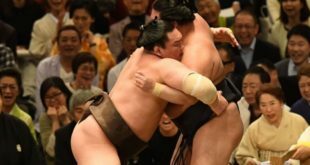 Le sekiwake semblait proche de la victoire mais il a été défait par une superbe contre-attaque de la part de Kakuryu. Quand Takayasu s’est déplacé pour attaquer son adversaire, Kakuryu s’est agrippé à sa ceinture et a exécuté au bon moment une projection vers le sol. Kisenosato a été malmené par Yoshikaze (6-5). Le yokozuna, qui semblait proche de sa première défaite, a maintenu son équilibre et a privé Yoshikaze d’une autre opportunité. 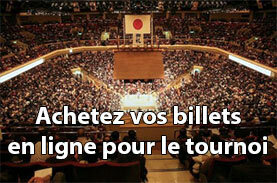 Frustré, le maegashira a voulu pousser trop loin et Kisenosato a profité de cette ouverture pour le charger par derrière. Terunofuji a survécu à un marathon de 39 secondes avec le maegashira 4 Arawashi (3-8). La défense des deux lutteurs étaient acharnée et ni l’un ni l’autre n’a réussi à s’affirmer jusqu’à ce que l’ôzeki finisse par exploiter sa taille à son avantage pour forcer Arawashi a quitter l’anneau. 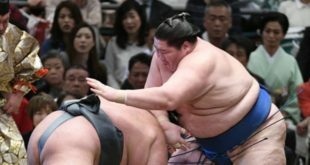 Le yokozuna Harumafuji (8-3) a battu Mitakeumi en un clin d’œil. Harumafuji a chargé sous la défense du komusubi, a attrapé sa ceinture et l’a tenu pour diriger son adversaire à sa sixième défaite. Le sekiwake Kotoshogiku (7-4) s’est incliné face à Ikioi (2-9). Tochiozan a vaincu Chiyonokuni et conserve ainsi sa seconde place dans le championnat. Yokozuna Kakuryu handed surprising sekiwake Takayasu his first loss on Wednesday, the 11th day of the Spring Grand Sumo Tournament, while yokozuna Kisenosato remained unbeaten. 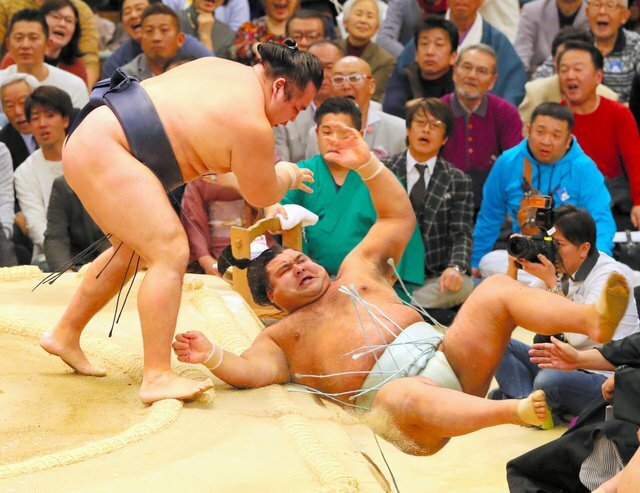 The newly minted yokozuna survived a scare from No. 4 maegashira Yoshikaze to improve to 11-0 in the 15-day tourney at Edion Arena Osaka. 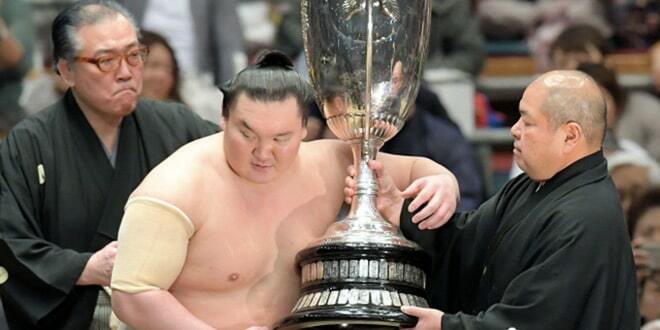 Ozeki Terunofuji and 10th-ranked maegashira Tochiozan also won to join Takayasu at one win back. Takayasu entered his match with a 5-11 career mark against Kakuryu (8-3), but looked solid and fully capable of beating the Mongolian, who avoided falling to a second straight defeat. The sekiwake appeared headed for victory but was undone by a superb counter by Kakuryu. As Takayasu moved in for the kill, Kakuryu snatched at his belt and executed a perfectly timed pulling overarm throw. Kisenosato followed his Tagonoura stablemate to the raised ring and was nearly shoved out by Yoshikaze (6-5). The yokozuna, however, kept his balance and deprived Yoshikaze of another opening. 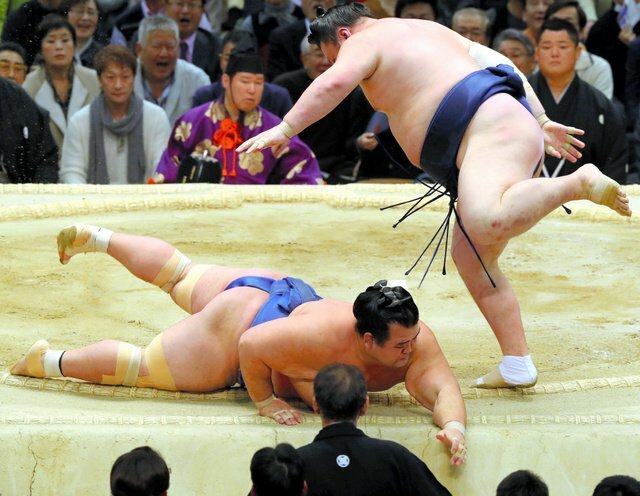 When the frustrated maegashira pushed too far, Kisenosato spun Yoshikaze around and easily shoved him out from behind. Terunofuji survived a 39-second marathon with No. 4 maegashira Arawashi (3-8) that ebbed and flowed across the ring with both wrestlers defending doggedly. Neither man was able to assert himself in the struggle until the Mongolian ozeki exploited his height and strength advantage to hoist Arawashi to the ring’s edge, where he dispatched him with an overarm throw. 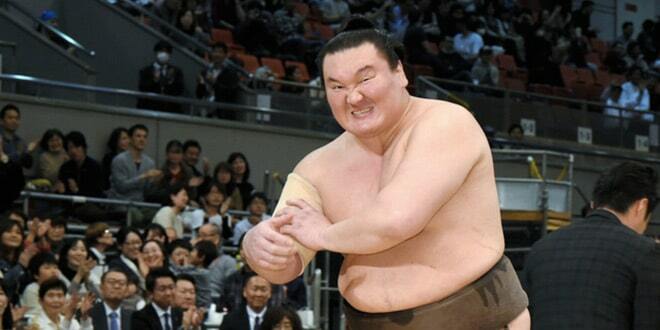 Yokozuna Harumafuji (8-3) barely broke a sweat in beating Mitakeumi. Harumafuji charged in under the komusubi’s defenses, grabbed a belt hold and steered his opponent out to his sixth defeat. Sekiwake Kotoshogiku, needing 10 wins in Osaka to regain promotion to ozeki following his recent demotion, fell to top-ranked maegashira Ikioi (2-9) to see his record fall to 7-4. Kotoshogiku tried to grab a left-handed, overarm belt hold on his charge, but it took too long to develop and Ikioi knocked the fumbling former ozeki to the sandy surface. Earlier, Tochiozan took advantage of a do-over to defeat No. 6 maegashira Chiyonokuni, who evaded his opponent’s charge but jumped too far back to exploit his brief advantage. Tochiozan stopped in his tracks and easily forced out the surprised Chiyonokuni, who fell to 7-4. Their first bout was ruled a draw after they were judged to have crashed out of the ring simultaneously.